The Palestinian Health Ministry has reported, Monday, that Israeli soldiers shot a young man with live fire, east of Gaza city. 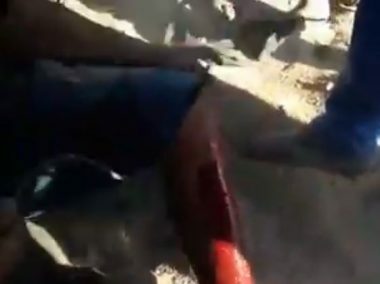 It said that the soldiers shot the young man in his leg, before he was rushed to the Shifa Medical Center, west of Gaza city, suffering a moderate injury. Media sources said the soldiers attacked several Palestinian protesters with live fire, in addition to firing high velocity gas bombs at them. On Sunday at dawn, the soldiers killed two young Palestinian men, after firing a missile at them, east of Jabalia, in northern Gaza. The two slain Palestinians have been identified as ِِAyman Nafeth Rabea’ Najjar, 24, and Mohannad Majed Jamal Hammouda, 24, from Beit Lahia, in northern Gaza. On Saturday morning, the Health Ministry said a teenage boy, identified the slain teen as Mo’men Fathi al-Hams, 17, died from serious wounds he suffered by Israeli army fire on Friday. Also on Saturday, the soldiers killed two Palestinians, including one child, identified as Majdi Ramzi Kamal Satri, 12, Ghazi Mohammad Abu Mustafa, 45, and injured 246 others, among them eleven who suffered serious wounds, 10 women, 4 medics, one journalist and 19 children.